Traditional games have always been a part of Karnataka’s rich culture. There are a variety of indoor, outdoor and board games that were popular in Karnataka. Many of these interesting games were played by both the young and the old. But with the advent of computers, mobile phones and play stations the concept of playing games have drastically changed in the state along with the rest of the country. Though a few of the traditional games are still played in Karnataka, people dwelling in the cities have lost touch with most of the traditional games. Let us take a look at some of the traditional games that were once enthusiastically played across Karnataka. Gilli danda is one of the most popular outdoor games played all over India and even in South Asia. It is called Chinni Dandu in Kannada. This game is believed to be the origin of many European and American games such as Cricket, Baseball and Softball. The game is played with a peg (gilli) and a stick (danda), both of which are made of wood. The stick is used to strike the peg. It is a team game that requires hand eye co-ordination and concentration of the player. Spinning the top or Lattu is a fun game played across many parts of India and Pakistan. It is known as Buguri in Kannada. It is an interesting traditional game where a wooden top is made to spin. There are grooves in the lower half of the top and a nail at the bottom to spin on. A string is wrapped around the grooves to deploy the top and make it spin. Popularly known as marbles, kancha or goli, it is a much loved gully sport in the country. It is called Goti in Kannada. This classic game requires the player to hit the selected target ‘marble’ using his/her own marble ball. The winner of the game walks away with all the marbles of the other players. This game requires aiming and concentration skills on part of the player. 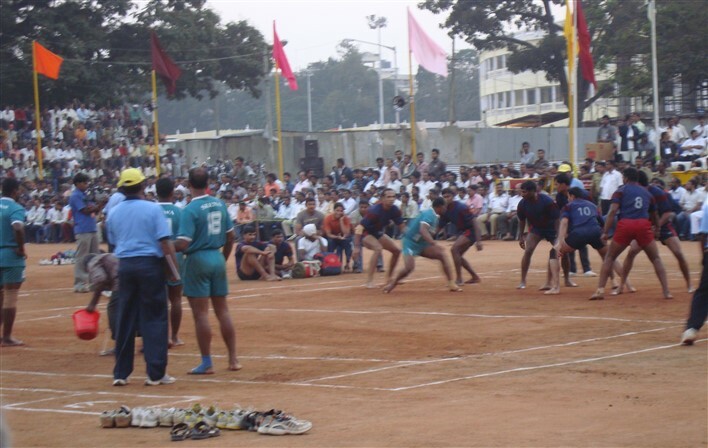 Kabbadi is a team sport that originated in ancient India. Two teams occupy opposite halves of an enclosure and each team sends in a raider to the other side in turns. The raider has to tackle members of the opposite team while chanting kabaddi during the raid before he returns to his side of the enclosure. It is a very popular sport that is played not only across India but also in countries like Bangladesh and Maldives. Kallu Gundu Ettuvudu or Kallata is an outdoor sport of rural Karnataka. It requires the participants to lift round stone balls (called kallu gundu in Kannada) of various sizes and weights. The sport demands that the players be physically strong enough to lift heavy stones. Pagade is a cross and circle board game that is very similar to the ancient game of Pachisi or Chaupad. This game requires 2 or 4 players to race their respective pawns to reach the innermost square. The origin of the game can be traced to 4th century AD and it has remained popular throughout history. Chauka Bara is one of the oldest board games of India that is still played in some parts of the country. It is known as Chowka Bara in Mysuru and as Chakaara or Chakka in north Karnataka. This game is similar to ludo and can be played by 4 players. It is a game of chance that is played with cowry shells (called kavade in Kannada). The players attempt to race their pawns from the starting point to the safety of home. The game improves eye-to-eye coordination and teaches to make strategies. Ashtapada is an Indian board game that originated before chess. The game is played on a board having eight-by-eight grid of squares of same colour and the board has special markings known as “castles”. Each player has an even number of game pieces and the objective is to move a game piece around the board in clockwise direction, enter the castle, and regain the castle back in a counter-clockwise direction so as to make the game piece reach the center. It can be played by 2 or 4 players. Snakes & Ladders is a classic board game that originated in ancient India. It is known as Paramapada in Kannada. The game can be played by two or more players on a game-board that has numbered, gridded squares. The board has several ladders and snakes drawn on it. Players have to navigate their game piece from the start to the finish based on die rolls. The ladders help the game piece to progress while the snakes hinder their movement. Ali Guli Mane or Channe Mane is a traditional indoor board game of Karnataka. The game is generally played by two players on a wooden board that has 14 pits. The pits are used to store 70 tamarind seeds or cowry shells that act as counters in the game. It is an engaging game that helps to develop logic, hand-eye coordination and concentration. A stack of stones, a ball and a focused eye is all you need to play the game of lagori in an open courtyard. This game is quite popular in the North and Eastern states of India and is fondly called pittu, lingochi or palli patti by many. However, it is becoming increasingly popular in Mangalore and a common outdoor norm amongst the youth. The game involves a pile of flat stones and two opposing teams. A player from one team throws the ball at the pile to disrupt it, and runs. The players of the opposite team reach for the ball and run to hit the players of the ball-throwing team who re-make the stack in the meantime without getting hit. It barely makes use of any expensive tools or equipment and is really easy to follow. No wonder it has been gaining heat lately. Tiger and goat is a hunt game that is known as Adu Huli Aata in Kannada. The game is played between 2 players where one player gets 3 tigers and the other player has 15 goats. The game is about the tigers trying to kill the goats while the goats look for ways to immobilize the tigers. This game requires planning and concentration on part of both the players. Nine Men’s Morris is a traditional board game that originated in the western world. It is known as Saalu Mane Ata or Jodpi Ata or Char-Par in Kannada and is popular as Navakankari in various parts of India. This alignment game requires 2 players. Each player is given 9 coins and they try to achieve as many points as possible by getting 3 coins in a row on the game board. It is a complex game that requires strategic thinking. Hopscotch is a traditional children’s game that is known as Kunte Bille in Kannada. The game can be played alone or with several players. It involves drawing a court on the ground and then tossing a small object into the numbered rectangles of the court. The player then needs to hop or jump through the spaces in order to retrieve the object. Kambala or Buffalo Race is a rural sport of Karnataka. This traditional sport involves farmers racing the buffaloes through tracks are ploughed into a muddy field that is made slushy with water. The sport is a source of much enjoyment for the rural folks of the state. Tug of war or rope pulling is an age-old sport that is known as Hagga Jaggata in Kannada. The sport involves two teams who pull on opposite ends of a rope in a test of strength. The objective is to pull the rope by both teams at opposite ends until one team drags the other over a central line. Four stone is an ancient traditional game that is known as Naaku Kallu Aata in Karnataka. It requires four independent boxes to be drawn on the ground. One player each stands in the four boxes and tries to take the four stones placed at the centre without being caught by the chaser in the game. Hand wrestling is enthusiastically played by the folks of rural Karnataka. The game is played with hands where one player has to hold with both hand and fingers his opponent’s hand under the wrist joint very tightly. The objective of the game is to prevent the opponent from freeing his hand from the player’s clutches. Then the player must free his own hand from the opponent’s clutch when his turn comes. These are just a few of the exciting traditional games that were once an integral part of Karnataka’s heritage. There are several other games that have been a part of Karnataka’s rich culture. But most of these games are on the verge of being erased from people’s memory these days. These traditional games can be enjoyed even today. Several of these games are quite interesting to play and can help to keep children away from the clutches of electronic games they constantly play on computers and mobiles.